I have a fairly simple circuit that works perfectly on the breadboard, but I am having a lot of trouble transferring it to a PCB. I am seeing very strange behavior which lies outside of my current experience, so I hope to get some advice. I have circled the part that is having trouble. R3 is a pull-down resistor, which is required b/c AMN42121 drives the output HIGH when motion is detected, but leaves it hanging for no motion, so pull-down is needed. I used C1 to smooth out the transition between motion and no motion. C1 makes the output level go to LOW slowly and smoothly, so "no motion" state is achieved after a few seconds of no motion. 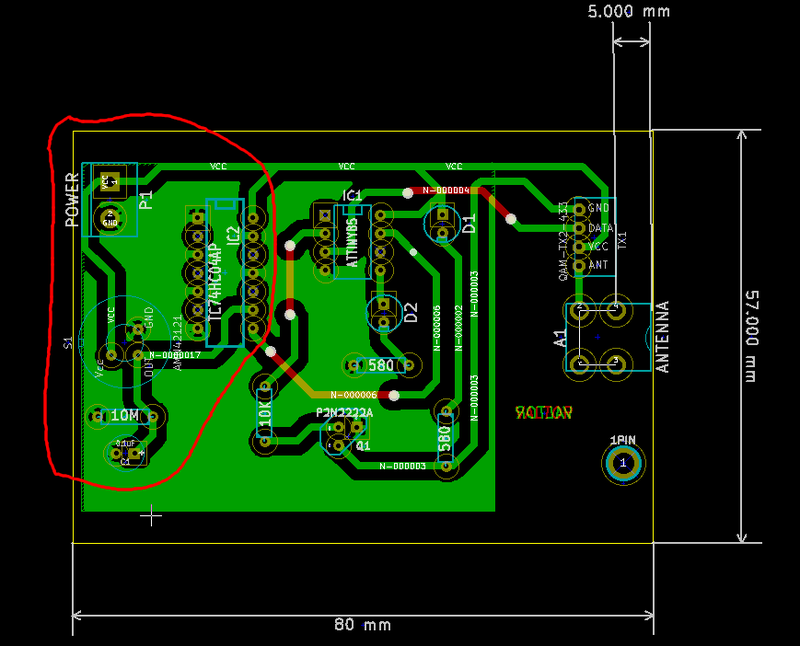 Inverter is there b/c attiny's external interrupts are triggered by LOW level, so I need to invert the logic. It is unfortunate that I had to use such a large DIP package for one inverter, but I couldn't find anything else. Again, I have only assembled the circled area so far. This is exactly what I want to see, so everything is fine up until this point. Note that unlike the first example, the signal in the second example is not generated by motion - that saw tooth shape just emerges on it's own w/o any action from me. Unplugging the inverter from the socket makes the sensor work properly again. Cutting power to the inverter while leaving it plugged in makes the sensor work. Using a different inverter has no effect. 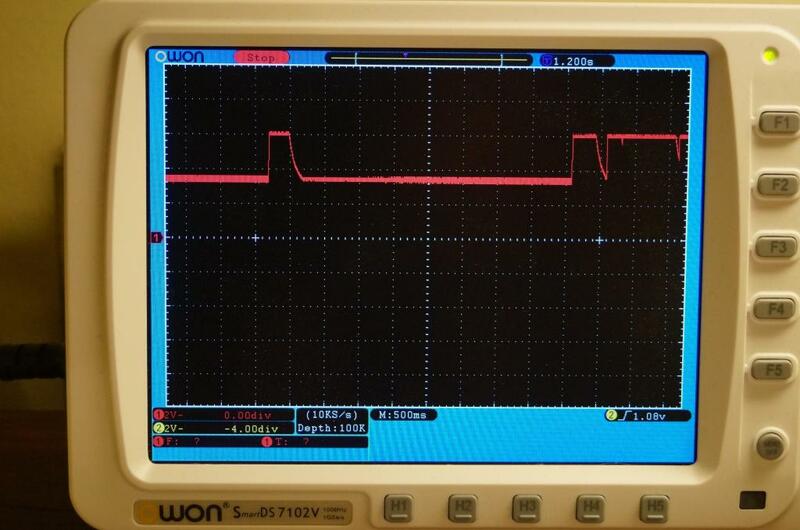 Note that even in this last picture the signal is not returning to LOW level all the way. The effect went away almost as soon as I stopped brushing. I am now out of ideas, so any advice would be greatly appreciated. Thank you. I have just discovered something interesting. A closer examination of example #2 (the saw-tooth shape signal) reveals that the downward slope is a segment of the expected C1 discharge curve. When voltage level gets close to the threshold of the inverter and spends too much time there, the inverter seems to be getting confused! It's generating that little burst of noise and then does something to kick the input back to HIGH, or simply hangs out in that "indeterminate" noisy state indefinitely until sensor output goes HIGH again b/c of motion (Example #1). To test this theory I replaced C1 with a cap that is 10 times smaller, thus making the discharge curve much steeper and "voila!" - the inverter is no longer getting confused and the circuit works! Of course, this defeats the purpose of C1, since it is now not providing as much delay as I want. I am not sure why I did not have this problem with the inverter on the breadboard, but it does suggest that there could be a very easy fix that can address this problem. I read that breadboards have a large "stray" capacitance, so perhaps I just need to strategically add some more capacitors somewhere? Any ideas? you are into the low uA for discharge. When the capacitor is full the 10M resistor will try to unload as well. 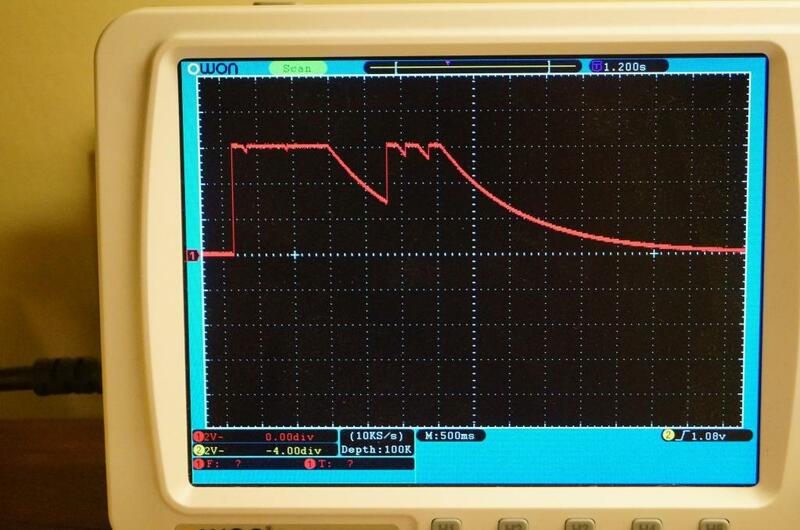 starting with 6v / 10M = 0.6uA. 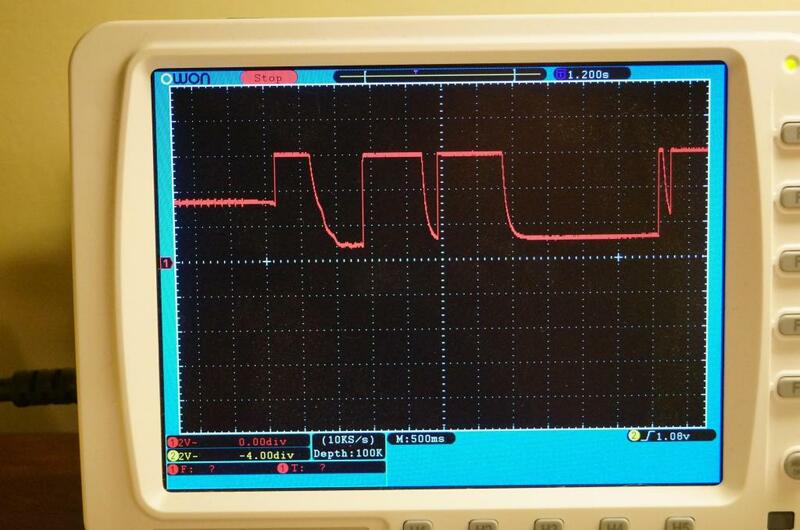 The input leak on the inverter is 1uA (small...... but nearly 2 x higher). Next to that a capacitor has an internal resistance as well. When the inverter cuts off, I would expect the capacitor output voltage to increase, as the resistance divider changes (higher inverter resistance as the input transistor is cut off, less current flowing) and have a lesser voltage drop over the internal resistance. 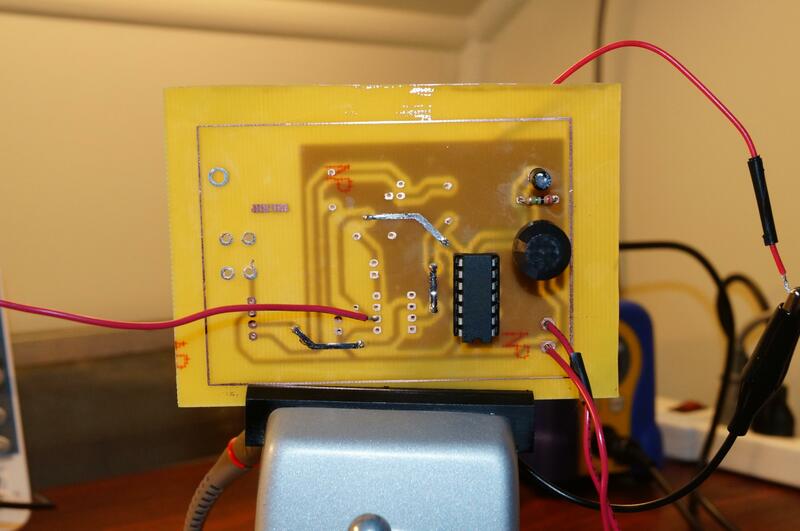 Why it worked on the breadboard and not on the circuit. ? not sure, but the smallest change in the resistor or capacitor values. Maybe the breadboard already has a different capacitor/ resistance as you mentioned or maybe because it was just heated up for soldering can already have a big impact. You could try to increase the capacitor and reduce the pull-down to act as the real discharger (instead of the inverter mainly doing that and get confused half way between off and on). You could also decide to bring an RC circuit after the inverter. A more radical approach is to replace the 7404 and build the inverter logic with a single transistor and some resistors. 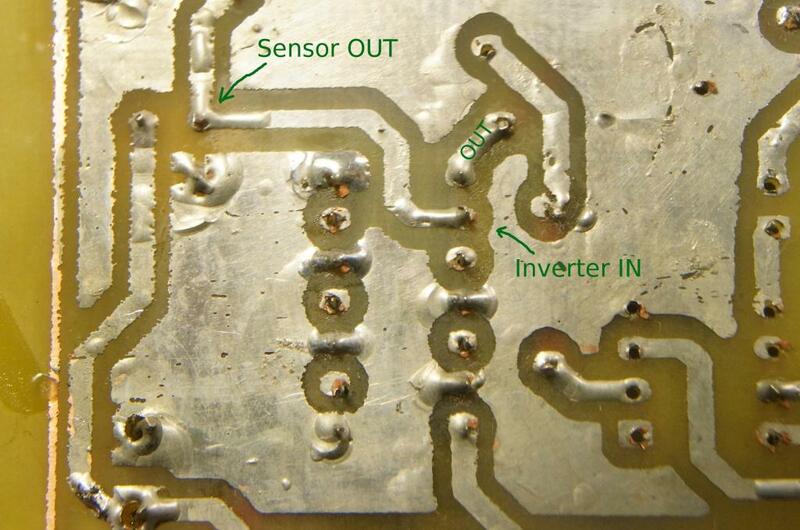 The photo showing the inverter pinout region of the board appears to be very poorly soldered. You probably have several bad or open connections. Nearly every connection needs to be touched up with fresh rosin core solder and a solder pencil, until all copper is covered and all connections are smooth and shiny, domed up from the copper to smoothly attach to the IC pins. I would use a single NPN transistor instead of an inverter package. Unused inverter sections with open inputs tend to oscillate. Not if the solder connection is bad. 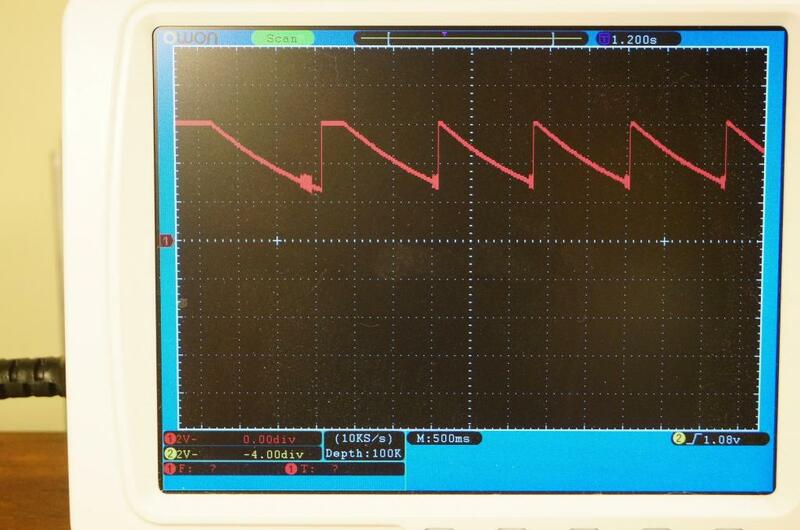 Exactly such a high impedance or open input, leading to inverter oscillation, readily explains the unintended oscillations described and pictured (5th image from top) in the OP.